India's Supreme Court has upheld a ban imposed by the state government in Gujarat on the slaughter of cows. The state imposed the ban 11 years ago but the Gujarat high court in 1998 said the ban was unconstitutional and violated citizens' fundamental rights. Gujarat's government then re-imposed the ban in 2003. The slaughtering of cows is banned in most Indian states. 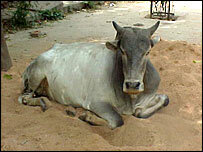 The animal is considered sacred by India's majority Hindu community. A seven-judge Supreme Court bench, headed by Chief Justice R C Lahoti, backed the case of the Gujarat government that the ban was in the public interest and showed compassion to living creatures. The Hindu nationalist Bharatiya Janata Party in Gujarat, led by Chief Minister Narendra Modi, re-imposed the ban in 2003 with the support of the state opposition Congress party. The issue of cow care and protection has often dominated state politics. Animal rights campaigners allege cows are mistreated in many parts of the country. Hindu hardline groups such as the Vishwa Hindu Parishad, or the World Hindu Council, say a national law will help it in its campaign against cow slaughter. Indian historians are divided over the tradition of eating beef in India. In a book published a few years ago on India's dietary traditions, Prof DN Jha, spoke about historical evidence of beef-eating practices in ancient India. But the eating of beef remains highly sensitive in India.